What is the opposite of a brilliant white diamond that reflects light and sparkles brilliantly with every move you make? A light-absorbing, captivating black diamond of course. Appropriately mysterious given their colour, less is known about black diamonds than the colourless diamonds we traditionally use in diamonds. How are black diamonds made? Black diamonds, like normal colourless diamonds, are formed by high pressure on the element carbon under the surface of the earth that produces a repetitive geometric pattern in the crystal lattice. The exceptional colour formation in black diamonds is caused by graphite inclusions and random clustering throughout and it is even believed that some black diamonds fell to the earth as meteorites, adding to their mystic appeal. Black diamonds are not transparent and do not display fire in the way that colourless and other coloured diamond do, but can still be incredibly impressive. Black diamonds may show white or gray inclusions that make them very unique. Due to the crystal structure, a black diamond will actually absorb most of the light that enters it. Rough natural black diamonds are found in very few locations, including Brazil and Central America. Natural black diamonds are considered fancy colour diamonds. Most naturals fancy colour diamonds are extremely valuable due to their rarity, with their price depending largely on the intensity of their colour. Black diamonds, however are more affordable than other white or coloured diamonds, in large due to the fact that they are less in demand. They are also completely opaque and cannot be graded according to their colour intensity as they are only found naturally in one colour – fancy black. An investment diamond is one that will rise in value over the years as their supply deteriorates and demand for them continues to rise. However, despite their rarity, black diamonds are not in very high demand at this stage and one would only be considered an investment item if it was considerably large or had a distinctive feature that would make it very desirable to investors in the market. Because of the fact that black diamonds are so rare, some diamond specialists have begun artificially enhancing low quality colourless diamonds by burning them in the rough state until they display the same opaque black colour of a natural black diamond. Artificially enhanced black diamonds are of course much more affordable than natural black diamonds, but they are not certified or recognised as true black diamonds by the GIA. 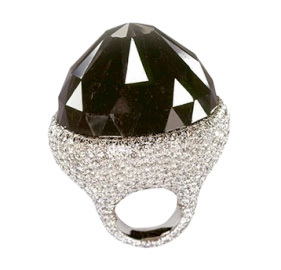 In general, buyers prefer natural fancy black diamonds – the real thing which is still affordable. Black diamonds have been spotted becoming increasingly often, adorning the hands, necks and ears of the rich and famous, from Angelina Jolia and Gwyneth Paltrow to Jennifer Lawrence and Cate Blanchett. 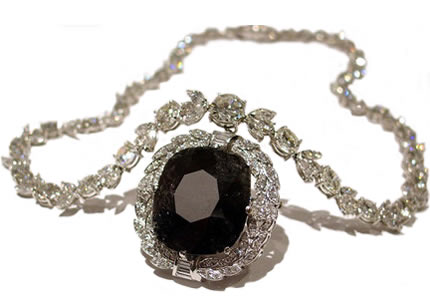 The most famous black diamond is the 67.50 carat Black Orlov – a cushion-cut brooch surrounded by a halo of 108 colourless diamonds, hanging from a necklace that’s adorned with a further 124 diamonds. The legend goes that the Black Orlov or the “Eye of Brahma” as it is also known, was an uncut black stone of 195 carats, pried out of the eye of a sacred Hindu God Brahma statue from a temple in India. At 312.24 carats the Spirit of de Grisogono is the world’s largest black diamond, and world’s 5th largest diamond. A formidable ring in a unique, mesmerising white gold mounting, it is set with 702 white diamonds weighing a total of 36.69 carats. This diamond originally had a rough weight of 587 carats and was mined in the nineties in west Central Africa. It was later brought to Switzerland, where it was cut by Fawaz Gruosi using the traditional Mogul diamond cutting technique. There is no information on the whereabouts of the precious stone or the identity of its current owner, although it is thought to have been sold onto a private client.